Root canals are never here to hurt patients—they’re here to help them recover from unpleasant dental pain. When a tooth becomes infected, the bad dental bacteria and debris may seep into the tooth. Sometimes it happens below the gum line, other times it may be from a hole in the tooth from decay. Either way, once the infection reaches the root of the tooth, the root can become inflamed and cause pain. By removing those materials, your dentist can restore your oral health. But this isn’t the only part that takes place during your root canal. Since your tooth must be opened and gently scraped clean, your tooth is now understandably weaker than before. The structure is compromised—but don’t worry. 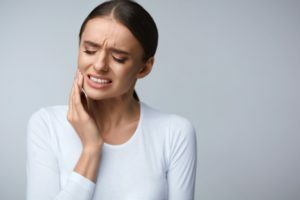 Your dentist in Philadelphia is here to help you re-stabilize it. Now that the tooth has been thoroughly cleaned, your dentist must help you rebuild the structure and stability of your tooth. This can be easily done with the help of a dental crown and gutta percha! Gutta percha is a filling material that’s heated and compressed into the canals of the tooth that have been cleaned out. This helps to provide a dense filling to make your tooth solid once again. Dental crowns are dental restorations that provide newfound stability for weakened teeth. Essentially, they are caps that are created from high-quality, tooth-colored dental materials that cover the tooth. Not only will your tooth now be free of infection, but it’ll be sealed and protected from cavities for years to come! Although you’re still expected to properly maintain this tooth, you’ll have less to worry about when it comes to your smile. Positional pain is tooth pain that occurs when you lie down or suddenly stand up. Referred pain is dental pain that not only occurs in your tooth but another part of your body, like your jaw, ear, neck, or surrounding teeth. Spontaneous pain is tooth pain that occurs from a stimulus, like a hot or cold drink. An abscess, or a hole in the jaw bone. Usually, your dentist can spot this during dental x-rays. A fistula is a white, yellow, or red pimple-looking bump that appears on your gum line filled with infectious liquid. Ultimately, we want you to know that your dentist is here to help you relieve pain, not hurt you. Knowing the symptoms is the first step, but it is up to you to contact your dentist to get the treatment you need. Here at Horsham Dental Elements, we value our patients’ comfort and work to create positive dental experiences. When you trust our team with your oral health, you can expect to experience high-quality dental care that solves your oral health issues. Feel free to contact us by phone at (215) 672-6666 if you have any questions!